HAVANA, Cuba (CNN) -- New Orleans, Louisiana, Mayor Ray Nagin arrived in Cuba late Friday on a mission to learn about how to deal with storms, a spokeswoman said. 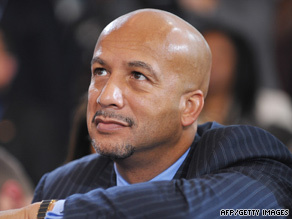 Mayor Ray Nagin watches President Obama speak in New Orleans, Louisiana, on Thursday. "We understand we may have a lot to learn from the Cubans in terms of disaster preparedness and how they have dealt with hurricanes," spokeswoman Ceeon Quiett said. Cuba is internationally applauded for exceptional disaster management, according to a news release from Nagin's office. In the Cuban capital, Havana, Nagin plans to meet with several officials, including some from the Latin American Medical Centers for Disaster. He will also learn about preparations the Cuba Defense Committee makes in advance of disasters. Nagin's trip comes a day after President Obama held a town hall meeting in New Orleans, still reeling from the aftermath of deadly Hurricane Katrina in 2005. "It has now been just over four years since that terrible storm struck your shores," the president said. "And [in] the days after it did, this nation and all the world bore witness to the fact that the damage from Katrina was not caused just by a disaster of nature but also by a breakdown of government, that government wasn't adequately prepared, and we didn't appropriately respond." Since Katrina, New Orleans has adjusted its disaster response with new evacuation plans. As Hurricane Gustav threatened the city last year, officials evacuated more than 18,000 residents, the release said. Three powerful hurricanes hit Cuba last year, damaging half a million homes and causing $10 billion in losses, according to the Cuban government. But only seven people died, thanks to a smooth evacuation plan. Some aspects of the communist nation's response, including mandatory evacuations, may not be possible in a democracy. Still, some Americans believe that they can learn from their Caribbean neighbor. The mayor of Galveston, Texas, another city hit hard by Gulf of Mexico hurricanes, visited Cuba this year. Nagin is the first New Orleans mayor to make an official visit to Cuba in 50 years. The State Department sanctioned Nagin's trip, Quiett said. He plans to return to New Orleans on Thursday.